There are many ways to give. 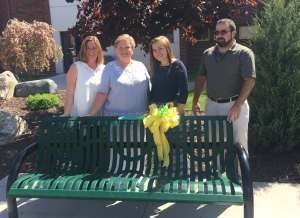 In 2016, the family of Lamar Knittle donated a bench in his memory. War Memorial Hospital is a nonprofit, community hospital. Donor gifts make it possible to purchase equipment and fund programs for our patients and community. Every patient matters. Every gift makes a difference. Gifts of securities may offer significant tax benefits to the donor. Contributions of appreciated securities held for over a year are generally tax deductible at market value, regardless of what the donor paid for the securities. This may provide the donor with a capital gains savings as well as a charitable income tax deduction. You may also notify the Development Fund at 635-4351 and we can assist you with making a gift in this way. A Bequest is a will provision that becomes effective upon an individual’s death and allocates all or part of the individual’s estate to benefit WMH patients. A Bequest can be general or specific. A specific Bequest may be designated to one or more of the hospital's departments or projects, such as the Cancer Care Center, Long Term Care, etc. Bequests most often are revocable and subject to change. Sample language and a introductory brochure are provided in documents below. A Beneficiary designation is a trust provision that becomes effective according to the terms of the trust. The trust terms may specify that WMH will receive a specific amount or percent of the trust assets upon an individual’s death, the occurrence of a specified event or at a specific time. A trust is funded by assets that have been conveyed to it so that they will be titled in the name of the trust. A beneficiary designation is similar to a bequest and can be general or specific. Trust assets donated to WMH may be designated to one or more of the hospital's departments. Beneficiary designations most often are revocable and subject to change. WMH encourages everyone to create and update an estate plan with the assistance of a qualified attorney and/or other advisors. Please contact Teresa with any questions about or ideas on how to support WMH through a charitable gift.